Abigail Cecile is one of our favorite needlepoint designers and we are so thankful she wrote this blog post for us! As soon as I drew the picture that would eventually become my Rooftops of Paris canvas, I knew it should be turned into needlepoint. Maybe it was the story of the picture, or being able to imagine myself in the scene, either way I was soon stitching it up. I was still quite new to needlepoint, my first introduction was while studying canvaswork at the Royal School of Needlework. There I worked on a piece full of stranded cotton and wool, I knew and loved those materials well, so naturally turned to them. 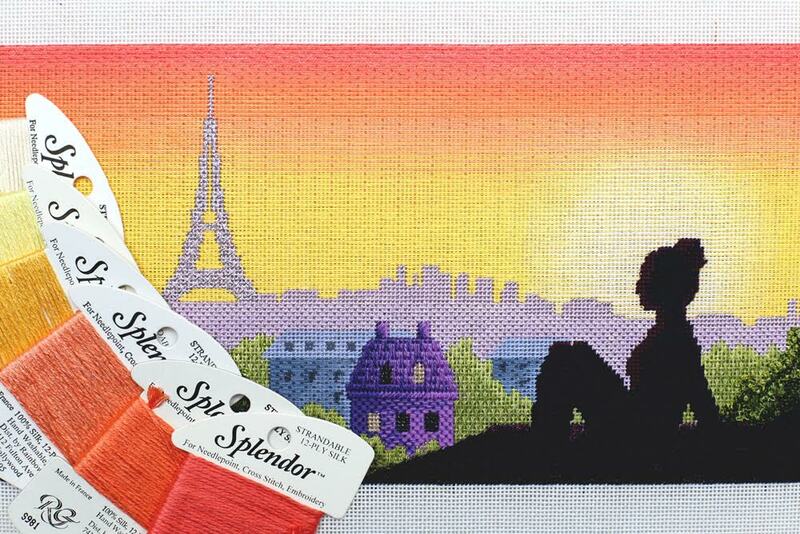 That is, until my good friend and mentor suggested I use a metallic purple thread to stitch the Eiffel Tower. Metallic, synthetic thread, sparkling metallic? I’ll admit, I was a bit doubtful. I dropped by my local needlepoint store and the minute I picked up that sparkly lilac spool, I fell in love. I tried all sorts of new threads on that piece, crinkly green stuff, over dyed silk, and probably most unusual Water and Ice, until the only thing left to stitch was the sky. I knew I wanted something with sheen, silk was the natural option. More importantly I needed a silk that came in a wide array of colors. I was looking for a seamless bridge between coral, yellow, and white. I found a wall of Splendor at the shop, grabbed six cards, and using a single strand and a popcorn stitch created the sky I had been envisioning, subtle and vibrant. It was perfect. If you’re stitching this yourself, you should know that the popcorn stitch is so time consuming! In my opinion, totally worth it but I think a darning stitch would be a good replacement, you would achieve the same look without spending all the time. What thread do you just love to use, what should I try next? Let me know in the comments below! You can learn more about Abigail Cecile and find all of her designs here.